SACO – Saco Drive-In manager Ry Russell doesn't mince words when he talks about what it means to be featured in a Honda promotional campaign highlighting America's endangered drive-in theaters. "This is the golden ticket to help us save the drive-in," Russell said Thursday, just before a camera crew arrived to film footage of the 74-year-old theater for "Project Drive-In." Set to launch in August, the online campaign will allow voters to choose their favorite drive-in theater. The five with the most votes will get a digital projection system, a costly upgrade that many aging theaters are struggling to make as movie companies phase out the use of 35 mm film reels that most drive-ins are equipped for. Theater operators say they don't know exactly when the distribution of film reels will stop, but they expect it this year. The Saco theater, the second-oldest drive-in in the country, will close after this season unless it raises $90,000, or wins Honda's promotional contest, Russell said. A local fundraising campaign so far has raised $10,000 toward the project, which includes improvements to the projection room as well as a new digital projector. "(Honda is) doing something that is really going to save five businesses," Russell said. "In the long run, if the Saco Drive-In is not one of the five, it does bring recognition to this dilemma drive-ins across the country are facing." Jessica Fini, a spokesman for Honda, said it seemed natural for a car company to support drive-in theaters, which she called "a piece of nostalgia that would be a shame to lose. ... A lot of them are family-owned businesses that have been part of the community for a really long time." 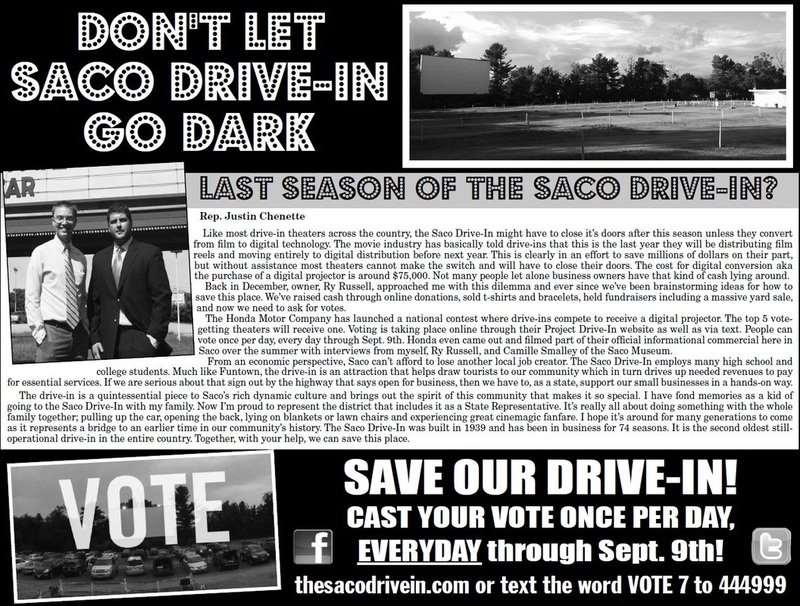 The Saco Drive-In was one of the first to be visited by a camera crew for the Web video, and Honda had not yet formally unveiled the campaign. The Saco Drive-In opened in 1939 and has become a beloved landmark in the community. Like many other people who grew up in the area, Justin Chenette remembers piling into the car with his family to watch a double-feature. Chenette, a Democratic state representative, is helping Russell with fundraising events, including a giant yard sale on Saturday. "The drive-in, for me, is one of the centers of the greater Saco community," Chenette said. "When I think of Saco, I think of grabbing a burger at Rapid Ray's and going to the drive-in." Russell said the Saco Drive-In is one of hundreds of theaters struggling to stay above water and make the investment in new equipment. While most indoor theaters have already made the switch, only about 10 percent of the country's 606 drive-in theaters have, according to the National Association of Theatre Owners. Fini said Honda isn't releasing many details about Project Drive-In until it launches, but did say one of the goals is to involve the community in saving theaters. "Our goal is to raise awareness to save this part of Americana," she said. Russell was already getting the word out about the campaign on Thursday by inviting people to come to the drive-in to be part of the footage. The drive-in's Facebook page has around 20,400 fans, an essential part of engaging the community in saving the theater, he said. "The community is really coming out and showing their support. It's huge," said Russell, who also is a social media consultant. "We have one of the largest followings on Facebook for drive-ins in the country." Russell and Chenette both said they hope that fan base – and their online votes – will help propel the Saco Drive-In to success in the Honda project. If the drive-in does win a projection system, Russell said, he will be able to help other drive-in theaters in Maine. After the Saco project is complete, he would divide leftover donated money between any of those theaters that are trying to make the digital conversion. "If we can get this (projector), it's a done deal," Chenette said. "We would have saved a piece of Saco history and a piece of this community." SACO — The Saco Drive-In has been a community fixture since it opened in 1939, treating movie buffs to the singular experience of cinema in the comfort of one’s car. Now Ry Russell, who has operated the drive-in since 2011, is hoping it won’t have to shut down after 74 years of service. For the drive-in to have a future, it needs updating – major updating. With the movie industry slowly phasing out film reel releases in favor of a more cost-effective digital format, the Saco establishment will soon need to retire its current projector in favor of one equipped to handle the ones and zeroes of the new era. The cost of a new projector, added to the costs of upgrading the facilities to accommodate it, could cost as much as $90,000, said Russell. 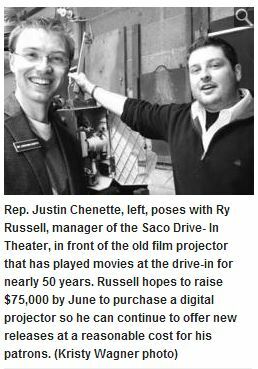 On Friday, Russell joined with Rep. Justin Chenette, D-Saco, to make a case for a fundraising campaign that both hope will allow the drive-in to continue screening movies after the 2013 season. As technological advancements prompt the film industry to slowly phase out the film reels played by the Saco Drive-In’s current projector, Russell has been ordering movies ahead of time, in anticipation of difficulties securing new releases. Orders have been made for films slated to debut in September; even in 2012, the drive-in found that it often had to wait longer than desired to procure the summer’s top movie draws, in some cases missing certain films entirely. “This isn’t something we take lightly,” said Russell. 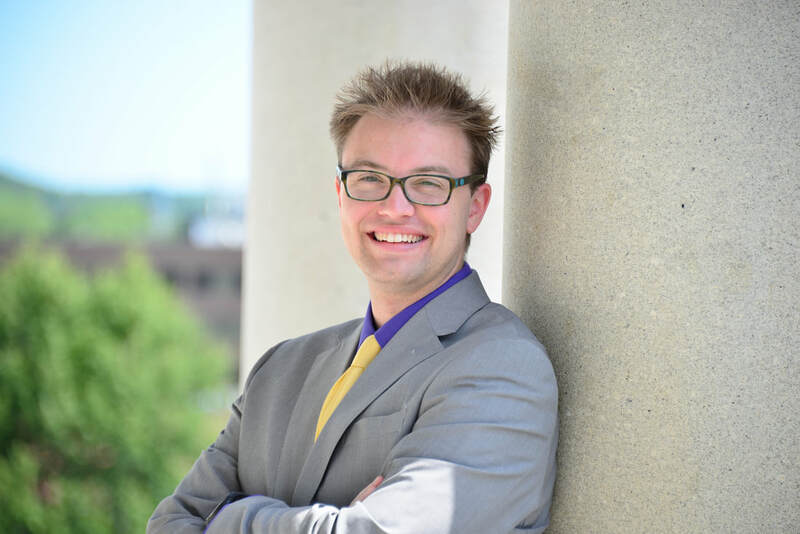 When Russell became the drive-in’s manager as a University of Southern Maine student two years ago, he anticipated that the switch to digital would occur over the ensuing decade. As it turns out, the transition is happening faster than expected. Russell fears that the drive-in won’t have a life beyond this season if the digital conversion doesn’t take place before the end of the year. The desire to retain this significant part of Saco culture is Russell’s prime motivation for launching the fundraising campaign, but as someone who frequented the theater when he was a child, it’s also a personal mission – he wants to make sure the drive-in, which offers low prices on both admission and concessions, stays available to those families looking for inexpensive entertainment in a shaky economy. “I remember the stresses that my own family was under during tough economic times, and this is what we looked forward to,” he said. To raise the necessary funds, the drive-in has posted an announcement on its Facebook page,www.facebook.com/sacodrivein , asking people to donate what they can. Those without Facebook accounts can contact Russell at sacodrivein@gmail.com for information on how to donate. Additionally, a number of fundraising events are planned, including a comedy show with a date yet to be determined. Announcements on the times and locations of future fundraisers will be posted on the Facebook page, and announcements will be made through newspapers and social media. Chenette, for his part, is using his profile as a representative to help spread the word about the fundraising efforts, guided partially by his own experiences going to the drive-in throughout his youth. Aside from the cultural status of the theater, which Chenette said is the second-oldest drive-in in the country, and the oldest in Maine, he cited economic reasons for keeping the venue open: It employs young people and keeps them in the state, he said. To involve himself further, Chenette is teaming with Russell to create an e-book, for which they’ve solicited stories from people willing to share their drive-in memories and experiences. Since the establishment has been around for more than seven decades, there have been no shortage of people willing to come forward with their personal stories. “It’s a range of people who have grown up with this place,” said Chenette. Russell and Chenette are hoping the needed funds can be raised by May. About $1,000 has been raised so far after an initial posting was made on the Facebook page, with families and individuals contributing small amounts, ranging from $5 to $20. That’s encouraging, said Chenette, since the full-fledged fundraising campaign has yet to begin. Russell said donations of any amount will be accepted with gratitude. “Anything but silence is a help,” he said. — Staff Writer Jeff Lagasse can be contacted at 282-1535, Ext. 319, or at jlagasse@journaltribune.com. Can community band together to save drive-in? SACO – The Saco Drive-In Theater needs help transitioning from old school film reels to digital film projecting. Ry Russell, 23, leases the Route 1 property and manages the drive-in business. Russell needs to raise $75,000 to purchase a digital projector or new blockbuster movies might not be an option after this summer. “It kind of came up when I first started here. It was estimated we had seven years before we would have to go digital so this shift is happening quickly,” Russell said. The drive-in was built in 1938 and used to be called the Automobile Theater. It wasn’t until the 1950s it was renamed Saco Drive- In Theater. Russell, who grew up in Scarborough and Saco, said the drive-in has received many emails and phone calls of support. Avant Dance and Event Center in Westbrook offered to donate space for a fundraising event. Russell said he is thinking of using the space to host a silent auction and maybe a comedy night. Hosting a giant yard sale at the drive-in in the spring is another fundraising idea Russell has received from supporters of the drive-in movie theater. “When people ask how they can help we say everyone can get involved however they are able. If everyone on our Facebook page donated $1 or $5 we could make this happen,” Russell said. The Saco Drive-in’s Facebook page has 16,309 likes. 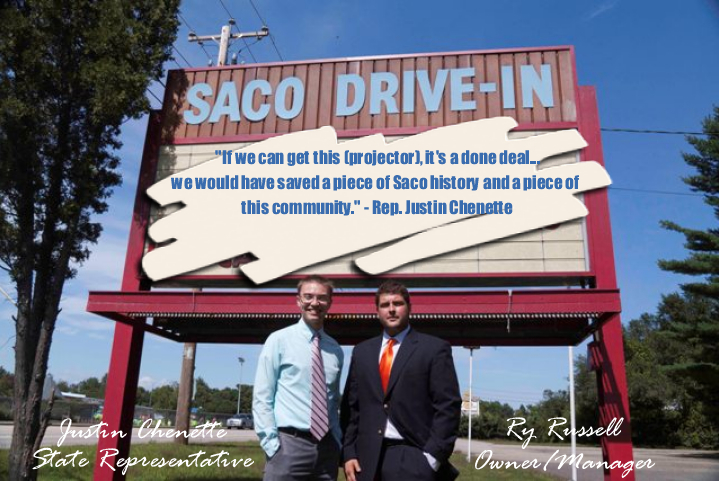 On board with the goal of saving the drive-in is Rep. Justin Chenette (D-Saco) who said the drive-in has an iconic and cultural value in the community. “I got involved with this because when I think of Saco I think of key icons like Rapid Ray’s; you go get a burger and then you go to the drive-in to see a movie,” Chenette said, adding he and his family would frequent the drive-in throughout the summers of his youth. “It’s hard to find nice family-oriented entertainment. This is a low cost option that supports the lower to middle class families,” Chenette said. Russell said he too would visit the drivein regularly throughout his childhood. Chenette said it is the oldest drive-in in Maine and Russell added many driveins across the country either have closed or are slated to close because of the digital dilemma. Russell said the drivein movie business maintains, but is not a moneymaker by any means. “Unfortunately, the movie margin is 80 percent expense right out the door and when we have a second feature we can be looking at upwards of 90 percent, but that’s the model. No one can do this and make a living,” Russell said. Russell, who works a full-time job at Primary Local, a residential mortgage company in Scarborough, said he got involved because he feared the drive-in would close if he didn’t lease it and keep it going for the community. “I came here to resurrect the drive-in not knowing in two years we would be facing same dilemma, just different issues,” Russell said. Film companies have been saying by 2013 most films will be converted to digital only because traditional film format is too expensive and being phased out. Russell said a lot of film companies have said after 2013 new releases might only be released in digital format. He said old movie nights are not an option to keep the theater going if he does not make his fundraising goal by the end of this season – old movies don’t bring in enough money to sustain the theater. “Unfortunately, old movie nights don’t work here. Families come here to see new movies at a reasonable price. A family of six can come here for $15. Raising our prices just is not an option; I cut prices when I came here. I remember being in a middle-income family as a kid and what our income limits were. Keeping this alive is about providing something for those families,” Russell said. The entire project from purchasing a digital film projector to weatherizing the small building it is housed will cost $90,000, but Chenette and Russell said they plan to raise $75,000 and theater proceeds will provide the other $15,000. The current projector is housed in the same leaky building the new projector would go in, but Russell said the old projector holds up in the rain – a digital projector cannot get wet. The current projector used by the drive-in is estimated to be about 50 years old. If a digital projector is purchased, Russell said he will keep the old projector at the theater. “We would like to make it so this summer isn’t an issue. We hope to do this by May or June, but it’s a lot of funds and we know that, we will do everything we can to get through this season if possible. The max deadline will be end of this season. We will need to have it or unfortunately that would be it,” Russell said. To donate time or money, supporters can email Russell at savethedrivein@gmail.com or they can donate through the drive-in’s Facebook page.